Lucy’s wedding in the fourth-season episode “End of the Road, Part 2,” gives the “Dallas” cast a chance to dress up and show off like never before. No one rises to the occasion quite like Linda Gray, who gets to wear two outfits. When the ceremony begins, Sue Ellen wears a brownish-gray satin dress with shoulders so wide, it makes Gray look like she’s been wrapped in a king-sized bedspread. This might be intentional. During the reception, a waiter spills a drink on Sue Ellen, and when she retreats to her bedroom to change, she discovers J.R. has been sleeping with Afton – in the same bed he shares with Sue Ellen. Until this point, Sue Ellen has been resisting the charms of her old college boyfriend Clint Ogden, a guest at the wedding who has been shamelessly flirting with her. Once she knows J.R. is cheating on her again – and with her “bedspread dress” stained – Sue Ellen apparently decides she has nothing to lose. She changes into a much different outfit: a form-fitting pinkish-orange garment with three big white flowers printed on the front. The u-shaped neckline swoops down across Gray’s chest and leaves her shoulders exposed, making this dress much sleeker and sexier than the bedspread. Sue Ellen seems to be letting the world know she’s available again. Lucy’s wedding gown is also revealing – figuratively, that is. She gets fitted for the dress in “End of the Road, Part 1,” when we learn Miss Ellie wore the gown during her wedding to Jock a half-century earlier. This seems appropriate. Lucy is a modern girl in almost every sense of the word, but she harbors some pretty outdated ideas about marriage. In “Start the Revolution with Me,” a later fourth-season episode, Lucy suggests she’d like to drop out of school so she can become a full-time wife to Mitch. At that point, it becomes clear: Lucy didn’t just inherit a wedding dress from the 1930s; she got a Depression era mentality to go along with it. 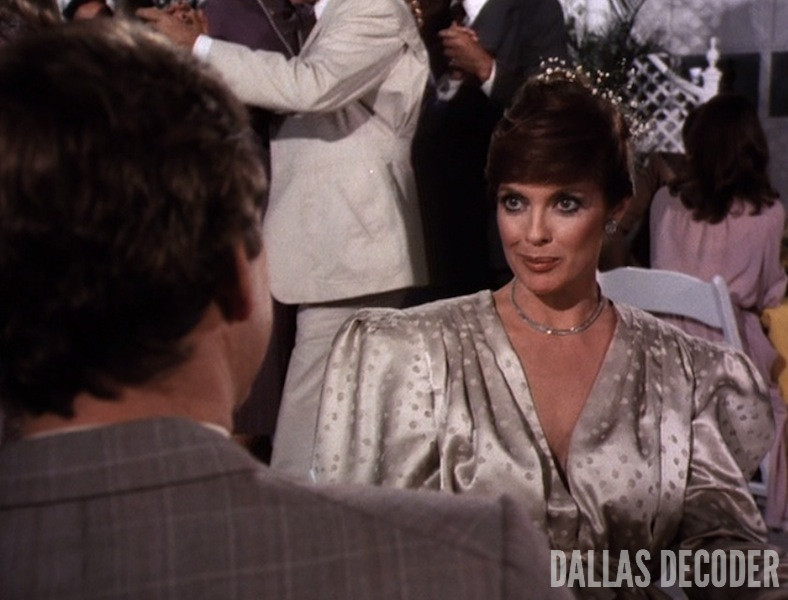 I love Sue Ellen’s second dress too. And I love Lucy, even if her views about marriage are curiously outdated. Hi Chris, I just discovered your website a couple of days ago (funny to see my first post here is exactly one year after the last one, LOL) and all I can say is: Wow! You’re doing a fantastic job! I hugely enjoy reading your essays. Your observations of details are great. BTW, I’m from Germany, where Dallas was extemely popular too (the new series not as much as the original one). Now, as for Lucy’s wedding – I think Lucy looked adorable as an old-fashioned bride. 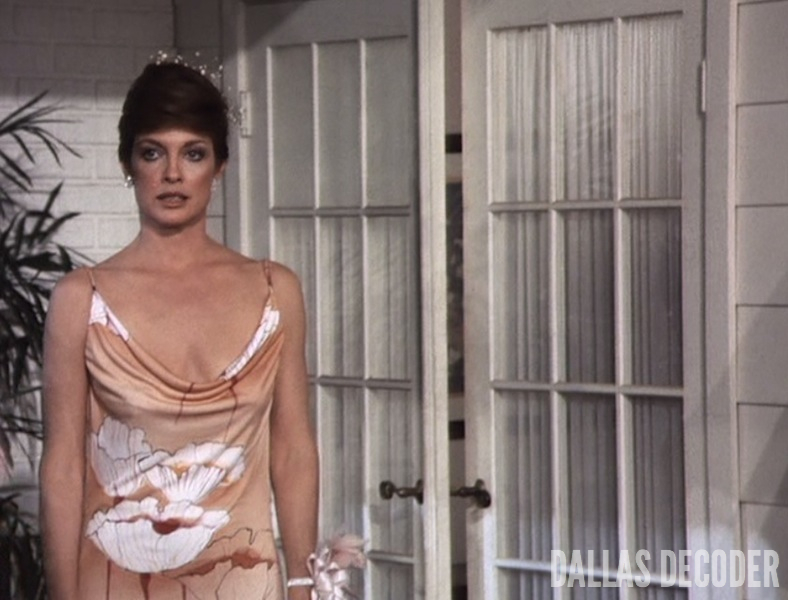 I loved your description of Sue Ellen’s first dress as a bedspread, LOL. Back to reading and commenting more… See you later! Thank you! You know, I stopped “Dallas Styles” because I wasn’t getting much feedback (and frankly, some of them aren’t all that insightful). I’m glad you like this feature. Perhaps I should revive it. I have some ideas in mind for a new version of “Dallas Styles.” Stay tuned!